This photo from Geoff Cooke (operator of rail tours) popped up on flickr. SWPV Zanha at Matille, in the Zambezi River delta near Chinde. 7.6.75.
an interesting picture I found on Graham Greenes Book "Travel without maps", it came out 1936, this is a new german edition. Greenes expedition led throught west Africa (specially Liberia and sierra Leone). The illustration picture was made by National Geographic Society, no further informatin was availiable. In the text I didn`t find anything about the motiv. Does anyone know something about the sternwheeler? Looks quite similar to this one, doesn't it? 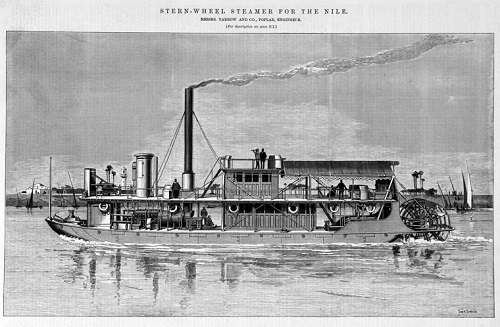 Doubtless also a type built Yarrow sternwheeler for the colonies. The superstructure was addet to the special purpose. Quite interesting sternwheeler "Garoua" for Benue River in Cameron. Built by D.W. Kremer shipyard in Elmshorn, builder date and further informations unclear - either before 1914 for the german colony or after first world war for the french part of the land. I got an interesting book today about Nile travelling in former days. It includes pictures and describes of Nile steamers. Last but one picture is the plan of preserved steamer "Sudan".